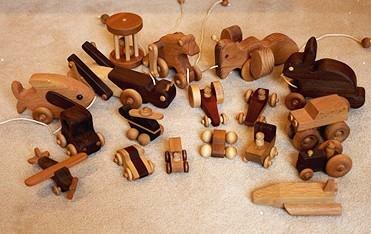 Choose from the many free woodworking plans available for toys. This type of toy is well liked among the youngsters because of the disassembly feature. 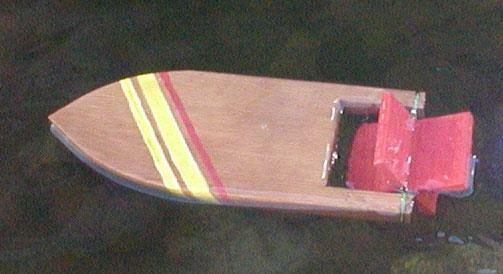 Both bodies and trailer top are cut from 13/4 inch hardwood stock. This monkey push toy will provide hours of endless fun for your younger children. 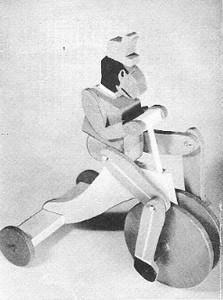 You can really see how well the monkey rides the tricycle. The leg joints are all pivoted in the monkey. The front wheels are fastened together on a dowel axle and both turn together. 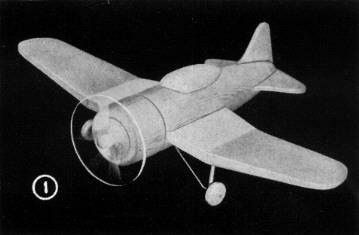 The realistic toy plane was copied from the U. S. Navy Corsair. 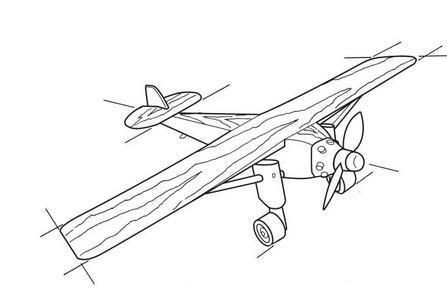 Follow these detailed plans to make this toy model plane for your future pilot. Young and old alike can try their skill at knocking over all the bottles in three chances. 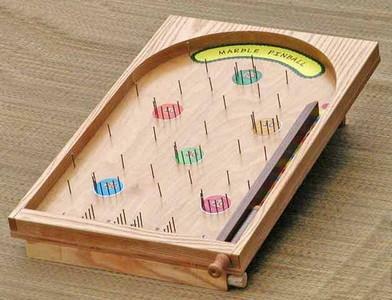 Here is an interesting game which comes in handy for picnics and church bazaars. 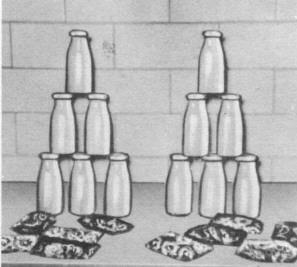 Pieces of scrap material glued to make six of these bottles are turned on the lathe to simulate a milk bottle. Here is a really fun puzzle that is easy to make. Amaze your friends by hooking the rubber band in the bottom. It will entertain for hours. 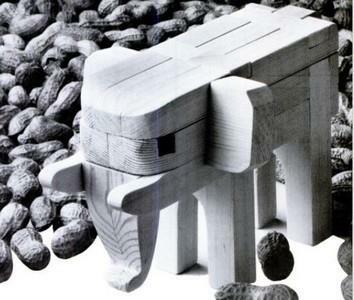 Lots of puzzle pieces that fit together to build a 3-D elephant. 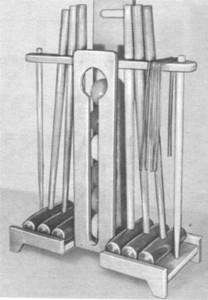 This basic project involves cutting the pieces of wood to length, marking where the holes are to be drilled, drilling the holes and simply bolting the pieces together. 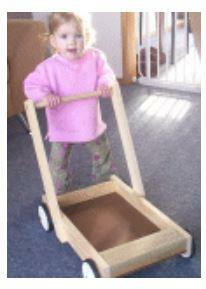 Apart from helping children to learn to walk, it also is a transporter for your child to move toys and blocks etc. around the room. 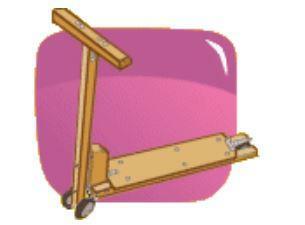 This pushcart is constructed using common stock and can be built in less than half a day. 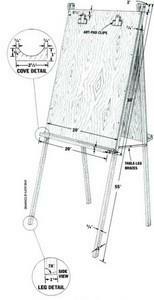 A simple to build easel with two sides for drawing. 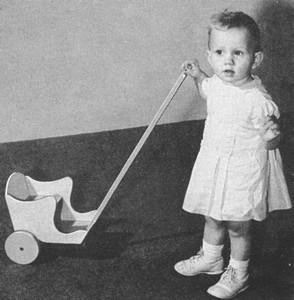 This simple, easy-to-build walker for the little girl's doll will provide many hours of enjoyment. She will have loads of fun parading around the house with that favorite doll. Build this light, yet sturdy toy dump truck. The bed of the truck even moves up and down for emptying loads. Your child will love this hand made gift. 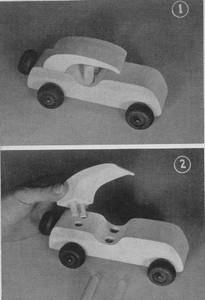 Build this simple and entertaining kiddie car for your toddlers to travel inside and outside the house. The child chooses their speed by how fast their little legs can move. 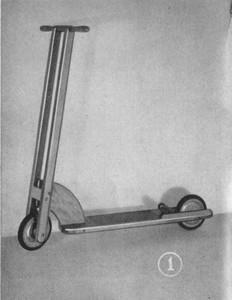 In just a couple evenings any home crafter can make a wooden scooter. Provides hours of entertainment for your kids. Make this homemade pinball game. It will provide hours of endless fun. 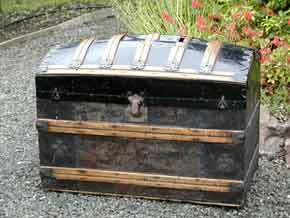 Using these directions you can build your own treasure chest to hold your most valued possessions. Chest measures 12 in. X 7 in. X 8 in. Feed your money to the pig. 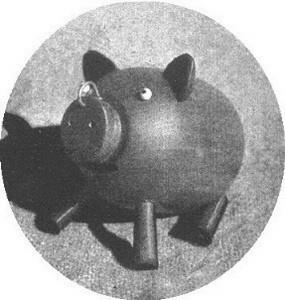 A piggy bank makes a neat turning project. Paint the feet black; and the ears and nostrils pink. 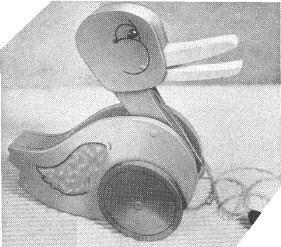 Easy to follow toy pattern and plan, plus a toy picture show. Detailed plans to build a vintage model airplane. Just let these easy to follow plans guide you to the creation of a project that any child would enjoy! Easy to build and thick enough to stand up on their own once your child has pieced them together. Here's an easy little toy you can whip up in an afternoon. This 10 in. pickup has a cartoon look with it's over sized wheels and bright paint job. The wheels were turned on a lathe but you can buy pre-made 2 1/4 in. wheels. Young and old enjoy croquet, a game that has grown in popularity in recent years and you'll enjoy making this beautiful, complete croquet set. 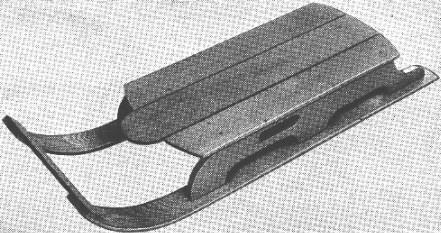 Here is an old-fashion penguin push toy. 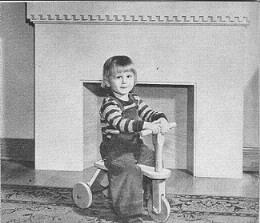 The original toy had a simple wooden ball on the end of the push rod but a 'T' shaped handle affords better control. Here is a scrap wood project that the children will enjoy. 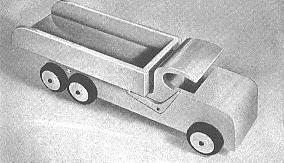 By following the diagram you can make your own wooden bus. 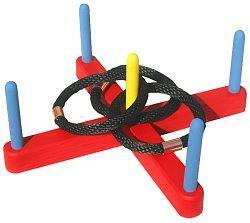 This ring toss game is easy to make by anyone with basic woodworking knowledge. Pull toys are always amusing, and Mr. Duck's wagging head and jerky bill movement will delight any youngster. 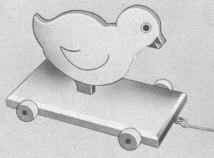 This chick pull toy is a great gift to make for your kids for Easter. 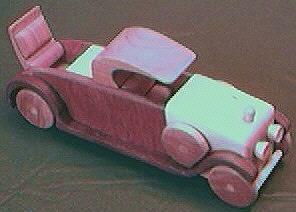 Pieces of odds and ends found in most shops are used to make this pull toy. 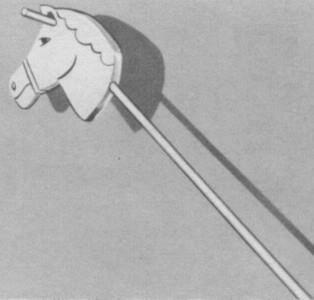 This project will take you through the complete seesaw building process from start to finish, with plans and step-by-step pictures and instructions. This is a very sturdy yet portable seesaw. The kids will have loads of fun. 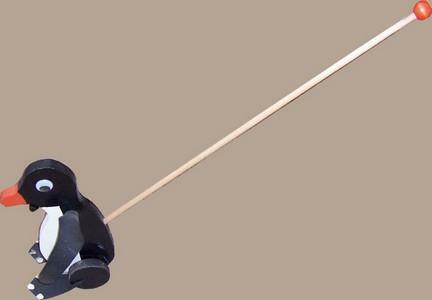 This bronco riding stick is a simple toy that will amuse kids outdoors during the summer months or indoors at any time. 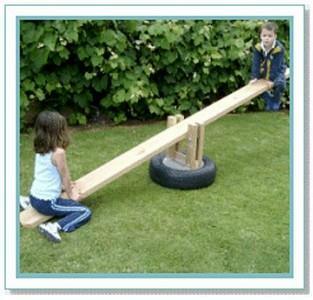 This sturdy teeter totter board makes the small children happy both indoors and out. 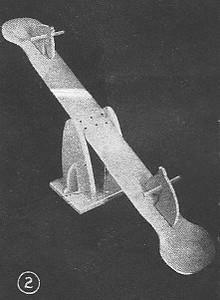 Plans to build this toy that provides hours of endless fun. A band saw, lathe, and drill press are required to make this amusing little toy. The design can be drawn directly on the 13/4 inch hardwood stock, or on a piece of cardboard or veneer for a template. 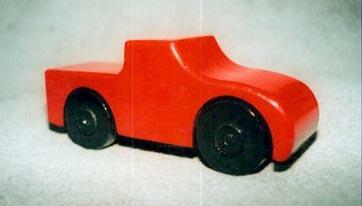 Your kids will love playing with this car. 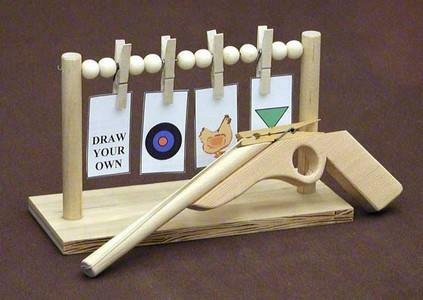 Make your own rubber band gun and target. Then get some rubber bands, set it up and start shooting. 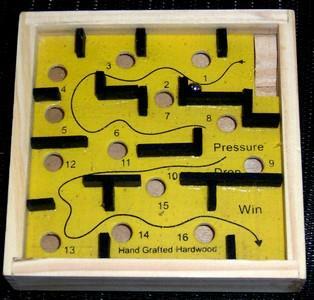 Here is a really nice SMALL version of my Labyrinth Marble Maze Game. The play piece is sealed inside the compact game board. Here is one piece of construction machinery your child can not live without. Instructions on how to make a road roller. The job can't be done without it. Here is a fine winter project for your workshop that will delight your child. 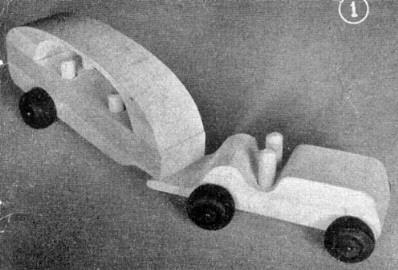 It can be made from all non-priority materials in a few hours time, but will provide endless fun for years to come. 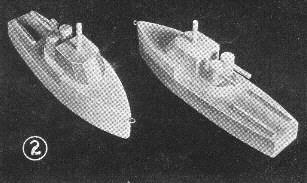 Make these toy paddle-wheel boats with your friends and have boat races.